Pumpkin fever has been running high in our home this Fall. 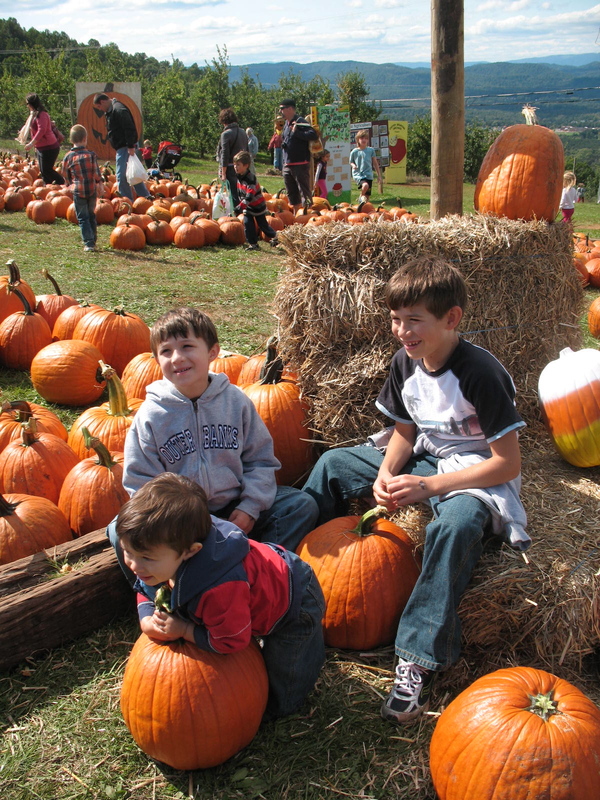 Nearly two months ago our 9- and 5-year-old boys started the constant questions that reveal their love of Autumn fun and especially Halloween: What should I be for Halloween? Do you think I could dye my hair yellow for my Tintin costume? Do you want to be a pumpkin, a monkey, or a giraffe? What treats are we going to give out for Halloween? When can we buy pumpkins? When can I carve my pumpkin? Back to pumpkin fever. Autumn fun is a blast with a little one in the house. Living life with a two-year-old never ceases to amaze me. His perspective and enthusiasm for life is infectious. So, naturally, he’s running a high pumpkin fever this year. At a recent family Oktoberfest party, he confiscated every remaining baby pumpkin on the kids craft table and painted them all. He loves throwing them around the backyard. (Better that then the acorn squashes in our pantry, which he also likes to pretend are balls.) And he’s playing a month-long game of I-Spy, special pumpkin edition. He points out every pumpkin he finds – the plastic decorative ones on the shelf at the optometrist’s office, the foam ones at the craft store, the pie pumpkins and carving ones at the grocery store, the beaded ones in the wreath on our front door. Every pumpkin. All his pumpkin sightings got me thinking. If Eskimos have over 100 words for snow, how many words for “pumpkin” might they have if they had pumpkin fever the way we Americans do, considering all the different types of pumpkins one finds in the typical American home or business? Perhaps dozens? At the outset of the month, I gave careful thought to our pumpkin plans. The older two kids made sure I didn’t let it slide. They regularly asked where we would buy our pumpkins this year and when they could start carving. See, last year we spent an untold fortune on the enormous orange treasures we found piled up at the local Apple Festival that thousands of people flock to on a nearby scenic mountaintop. Memorable? Yes. Budget-friendly? No. But we had promised them pumpkins picked from a patch. Or as close to it as possible. The idea of picking a pumpkin from a big box store or similar just didn’t feel right last year. However, as our food bill has swelled in response to the needs of our growing boys, I decided that the display of pumpkins at our Whole Foods store was charming and farm-y enough to support, especially at about a 70% savings over the mountain-top selection. The kids didn’t seem to mind. They finally had their pumpkins. While my wallet thanked me, my inner-Autum-loving-self wasn’t satisfied. It just didn’t have the magical element that makes Fall so special to me. 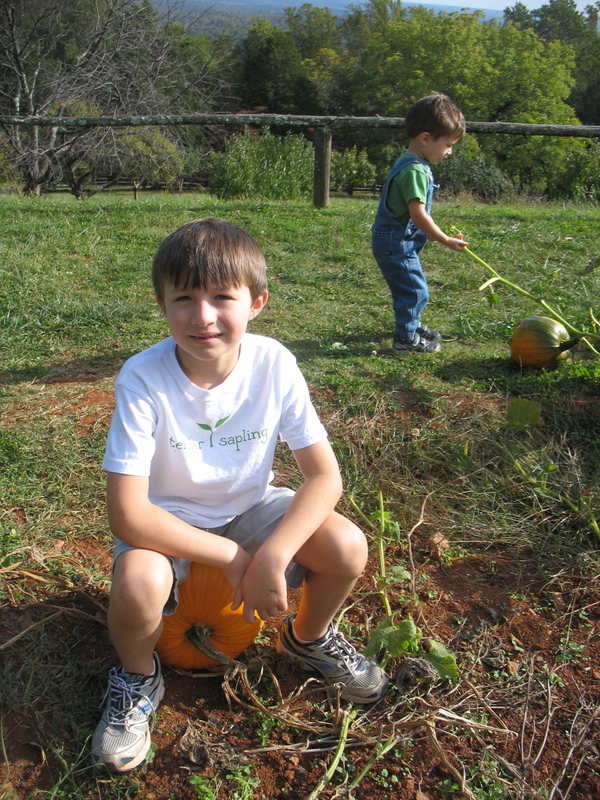 Truthfully, early in October I scoured the list of pumpkin patches in our local family magazine to see if any would meet our ideal: pumpkins growing in a patch that our kids get to pick themselves. We almost hit it one year, when a nearby greenhouse and farmstand hosted a hayride to a pumpkin patch where our oldest (and only at the time) selected his own pumpkin that had already been cut and was laying in the field. Fast forward a few years, we returned there to find no hayrides and a field that had grown other crops, long-harvested, that was sporting imported pumpkins. The owners said it was the only economical way for them to do it and the hoards of visiting preschoolers didn’t know the difference. When I thought about our progression – from those patches to the mountaintop pumpkin pile and this year’s grocery purchase, I felt a bit sad. Where were all the pumpkins on the vine? Reading a friend’s blog post about her son’s mysterious seed-turned vine-turned pumpkin surprise made me wish for a more authentic pumpkin experience with my little ones. It’s amazing how some of our innocent wishes for our children can be answered. A few days after this year’s budget-conscious purchase, we hiked up to Monticello, the home of Thomas Jefferson, just one mountain over from the ridge with the pile of pricey pumpkins. We waded through the fantastic 1,000 foot long garden, oohing and aaahing over the abundance of hyacinth beans and tomatoes, sea kale and eggplants. Just when we thought it couldn’t get any better, we reached the quiet, somewhat bedraggled and less-visited end of the garden. If the garden were a house, this would be the laundry room. Just a handful of patches of worn-out earth with some shriveled stalks of some crop scattered here and there. And that’s when we saw it. Vibrant splashes of orange in a tired looking mess of vines. Could it be? Pumpkins? We skipped closer. Yes! Pumpkins! And not staged pumpkins. This was the actual pot of gold at the end of the rainbow: A real pumpkin patch. With pumpkins still attached to their vines. We had found the motherlode of pumpkin patches. But here’s the catch. These were not for sale. The garden at Monticello is a display of the horticultural ambitions of Thomas Jefferson – literally a living museum. And the vegetables grown benefit Monticello’s foodie events and staff. You can’t buy any of the veggies. While it may be cool to sample a little basil at the historic garden, I can’t imagine even the most “what’s yours is mine” personality successfully hauling a 10-pound pumpkin down the mountainside past tourists and staff. Yet that didn’t matter. We had found the real thing. The life story of a pumpkin, still attached to its umbilical cord. And the three kids ate it up. Not literally, you know. They played to their hearts’ content in the true breeding ground of the orange balls, their little hands rolling them as far as the vines would let them stray from their roots. No fabricated pumpkin patch or impressive heap of had ever satisfied them like this garden patch. A real pumpkin patch at the top of Monticello! The next week, we climbed Monticello again. Not with the intent of playing with pumpkins. But climbing the terraced garden’s 12-foot retaining wall led to garden wandering and there we found ourselves, drawn by their magnetic force. This time, the pumpkin that our five-year-old had most loved last time had matured to its pivotal point. During his play, it popped off its vine, like the two front teeth that had wiggled and jumped from his mouth earlier in October. And there it was. The pumpkin picking moment I had dreamed my kids might experience – a gift of the universe that happened without any parental planning. Like so many great things in life – unscripted, genuine, and fun. Here’s wishing you many magical discoveries and memories this Pumpkin Season! Happy Halloween! What are some of your favorite Fall moments, planned or unplanned? Categories: Have Fun | Tags: autumn, halloween, monticello, pumpkin patch, pumpkin picking | Permalink.